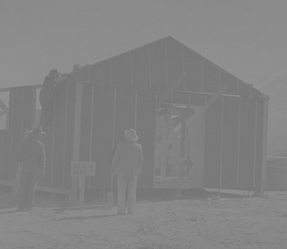 1 b&w; image taken at Manzanar concentration camp in California. Exterior shot of a barrack being built. Outside framework and walls are up, roof is missing. 2 men are working inside barrack. 4 men are looking at work from outside. Sign in front of barrack reads: Blk 1, Bldg 1. All requests for permission to publish, reproduce, or quote this image must be submitted to the Hirasaki National Resource Center at the Japanese American National Museum.